The newly designed Visual Worship Trax series from iWorship combines today's top worship songs with inspiring, lyric based videos for use in churches and small group settings. All lyric videos feature the original artist masters and come in original stereo, split-trax and click-trax versions. Visual Worship Trax is the perfect performance trax solution for use with worship teams or special music. This 2 disc set features identical content on a DVD-ROM - for use with computers and projection software and a DVD- for use in DVD players. -Compatible with most lyric projection software. 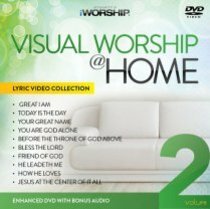 About "Visual Worship @ Home Volume 2"